The KL1508Ai Dual Rail LCD KVM Switch is a control unit that allows secure access up to 8 computers from a single KVM (keyboard, video, and mouse) console. 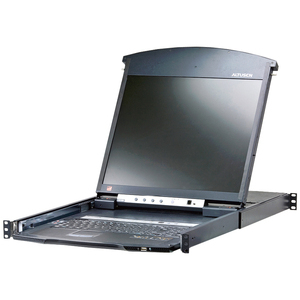 It consists of an integrated LCD monitor, keyboard, and touchpad in a 1U rack-mountable retractable sliding housing. The LCD and keyboard/touchpad modules slide independently of each other. Product Description: ATEN KL1508AiM, KVM console, 17"
Device Type: KVM console, 17"